Changes in the rates of interest are often portrayed as part of the decision-making role of the Bank of England. Over the past 8 years or more, the Bank's committee has given the impression that in making 0.25% adjustments hither and thither, it has among other things successfully prevented a mortgage debt meltdown. The image is one of a firm hand on the tiller for the benefit of consumers. Over the past 14 years interest rates have fallen from 15% to 4.5%. Curiously when they were at 15% no one at the Bank of England wanted to claim responsibility: remember Black Tuesday, 1992. This steep change reflects a host of political and economic factors but the central feature is that rates of interest express a relationship between two capitalists (that is, between a lender and borrower of capital), which in its classic form was between financier and manufacturer. However, increasingly now in Britain it is a relationship between international capital and UK domestic banks where the banks borrow and convert the capital to money and then credit the money to workers as a means of exchange, at usury rates. A good example is credit cards, where usury rates in excess of 16% apply at a time when the Bank of England base interest rate is 4.5%. This means that capital is currently making an annual return of at least 11.5%, shared between international capital and domestic banks, by simply providing money credit to British workers, who go on to buy overpriced imported goods. No wonder international financiers and importers quietly call Britain "treasure island". Low interest base rates for capital have also served this government and employers well by maintaining consumption through augmenting workers' spending, while keeping wage rises to no more than 3% per annum. Indeed, the current level of debt is so finely balanced that even a 1% rise in base rates would result in many workers falling into penury, which is a slightly different take on "one wage packet away from destitution". The current historically low rates of interest are not of course confined to Britain. For example in Europe they have stood at around 2.5% for several years and in the US have only recently risen from 2.25% to above 4%. And for many years now in Britain, base rates at 4.5% have been relatively high compared with Europe and elsewhere because we have little real wealth-creating capacity. So a higher risk premium is placed on Britain by international capital markets mindful of the greater possibility of default by their British host. Another wake-up call revolves around the question of pensions. Government and employers see the current relatively low rates of interest as an opportunity to cost pensions at all-time high projected values. The year 2030 is often used as the pensions doomsday date. But one simple question that never seems to be raised by experts is this: Why is it assumed that a constant rate of interest of 4.5% per annum or below should be applied to cost pensions for every year between 2006 and 2030? After all, there is no such thing as a natural rate of interest. Why not cost pensions assuming a future rate of 7% per annum (this is the average base rate from 1919 to now)? If we did, the current pensions paper deficit would miraculously disappear and with it the alarmist stories in the media that are used to create an environment where it is hoped that workers accept a massive cut in deferred pay. 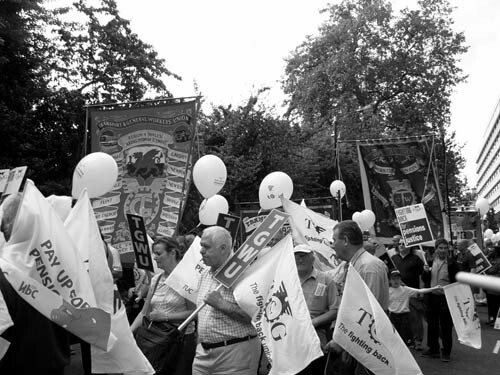 19 July 2004: workers take to the streets of London calling for decent pensions. The pensions crisis is phoney: the lower the interest rate assumed in calculations, the bigger the projected paper pensions deficit, which is then further hidden by Malthusian worries of workers living longer and "dependency ratios". It is not by accident that this mock concern first emerged with the stock market collapse of 2001, when the phoney message was easier to project through a combination of low interest rates and a falling stock market. Of course the stock market is back to levels of four years ago, and the trick of fooling workers out of their pensions has become more difficult to pull off. The fact is that interest rates have fluctuated throughout our industrial history. For example, the summer of 1843 ushered in a period of remarkable prosperity; the rate of interest was 2.5% in the spring of 1842, then fell to 2% in the spring and summer of 1843; in September it fell as low as 1.5%; whereupon it rose to 8% and higher during the crisis of 1847. So why now in 2006 do we assume that low interest rates are here to stay? Rates of interest express a relationship between two capitalists – namely finance and manufacture – not between capitalist and labourer, yet often now it is implied that the caring Bank of England is helping or is concerned about the consumer when it pronounces on rates. Nonsense. Levels of interest are determined not only by the general rate of profit but also how that profit is subdivided between finance and manufacture, that is, what portion of surplus value will fall to the lender and be called interest. It is this relationship upon which the Bank of England pontificates. Given these variables there can be no such thing as a natural rate of future interest. The real question is how are we as debt-ridden, lowly paid and lowly pensioned workers going to respond to the likelihood of increasing rates of interest during the coming years, because the current crisis will eventually lead to higher rates. Engels observed in 1894, "Nothing is more amusing than to hear the directors of the Bank of England chatter back and forth that a high interest rate and a low profit cannot permanently exist." Back to 2006 and the Deputy of the Bank of England last week added his voice to a growing chorus of concern over rising asset prices, saying that "markets have become frothy as investors seek higher returns and growth, in a low interest rate environment". Are we just onlookers in a casino where others gamble on our future and work out new ways to cheat us out of our cash? It is time for workers to intervene and strike out for something new.